I took a look at my phone bill tonight and noticed some charges for a voice messaging service that I certainly haven't authorized. When during a search on the company name, this is the first site that comes up: Consumer complaints about ILD Teleservices. Lovely, huh? Of course everything was closed so I haven't been able to contact anyone, I only hope that Verizon will just remove the charges without too much hassle, although from what I've read, they may tell me I have to contact the company. It boggles my mind that someone can add charges to my phone bill without my knowledge whenever they please, but my mother can't make a doctor's appointment for my father! (Much complaining about the HIPPA laws this weekend). But perhaps karma will work for me and I'll get a cooperative CSR since I always do my best to help out the people who come to my counter. Although I probably should erase that because I've likely just jinxed myself!! Anyway, check your phone bills! And call up your telephone company and ask them to block 3rd party billing so you don't have to worry in the future. To anyone who accessed my blog while my the style sheet was unavailable. It looked quite a fright! I overwrote everything on my server when I started working on the new "Witness" site -- not thinking how that might affect the blog. I think I've got everything back up that I need, but if anyone notices anything else amiss, please give me a shout so I can fix it. I did manage to get some stitching in, despite the temporary switch in my obsessional focus. 2500 stitches, in fact. 98% of which were black! Not very interesting, but it was probably a good time to do it. There is something particularly relaxing about not having to pay attention to a chart -- just thread up the needle and go. Nothing really to show since I posted the before image, but I'm putting it up anyway. Quite a bit left to go on this one. Hopefully I'll be able to get through all the black before becoming disinterested. I'm debating whether to start back up on Cirque des Cercles or go to bed. My head feels a bit odd. But you know, I little stitching probably wouldn't hurt. I've been working on that *delete expletive* website all day and am finally happy with the layout and I think I've got everything working the way it should. I've been sitting at this desk since 8:00 o'clock this morning and my feet have swollen up, my shoulders are frozen in a hunched postion, and my eyes feel a bit wonky. I think I'm going to make an attempt to go to bed. Of course, I won't be able to sleep because there is still so much I need to do! Why is it that I can't get into a funk like this about housework? My obsessive thoughts have turned from stitching and are now focused on my final project for the web design class I am taking. I have to do two pages, personal and business. I'm going to use the blog template I've developed for the personal page. It's got most of the elements she's grading on and though technically it's bad design (waaaaaay too many graphics -- particularly of the blinking kind), the scoring sheet doesn't mention taking points off for visual overload. And I personally think it looks pretty good. I've gotten permission to use my Witness the Obsession page for the business one. It's supposed to be "professional". The original pages have come down and I'll be putting up the new site over the course of the next week. Take a look here and tell me what you think. Can a site this PINK possibly be considered professional? I am stitching this on 40 count Examplar linen from Lakeside Linens with the recommended NPI silks. Mine doesn't seem to be as vibrant as some of the WIPs I've seen, I wonder if that's because of the fabric or perhaps it's simply my imagination. No matter, it was a bunch of fun to stitch. So much so that I plan to work on it again for one of the "Favorite" slots in this month's iteration. I decided not to use french knots for the eyes, since mine always come out lopsided. And rather than f illing in the block and doing a small straight stitch over the x as suggested, I did one over-one stitch with the black in the corner away from the nose. You don't notice that the remainder of that block isn't stitched, unless you look very closely. The one thing that bothered me about the WIPs I've seen of this project is that all the heads look like skulls to me. Rather sinister. Making the eyes smaller helped a little. But I think the real issue is the floss color used for the faces, so I might use the more fleshy color (used for Adam and Eve's arms) to do the remainder of the faces. Next up is Frog Prince. This is another project that I've started on three different fabrics. I settled on the 28 count bone Lugana. And I've finally realized that 25 count Lugana is the best for me! Hopefully that will limit the number of restarts in the future. The pic shows my progress so far. Lots and lots of black! Good thing I picked up a new skein when I was at Wal-Mart yesterday. I ended up using Silk N Colors Kaleidoscope on the Precious Metals fabric from Silkweaver. I'm still not 100% sold on the color, but at least I managed to finish the first motif and then some! I'm having a hard time figuring out how to stitch each motif so the colors flow together nicely. But then I might be expecting too much since the colors all kind of clash anyway. I decided to skip over Angel of Frost this rotation when I found myself cleaning rather than putting her on the scroll frame! Once I came to my senses, I started on the Days of Advant Sampler. It's all good though, since I no longer have to risk broken bones simply to walk across my living room. My youngest had decided to make a fort over the weekend which ended up including all the kitchen chairs, 15 or so boxes of various sizes, and most of our video tape collection. Don't ask me what she was doing with the videos, who knows what she was thinking. Oh, and two or three blankets, but blankets strewn around the living room is a pretty normal occurrence. And the answer to that in this case would be NOT. I got a bunch done on Goblin Tree yesterday, over 1200 stitches! I thought it was looking a bit off, but instead of getting off my behind and checking the cover image I kept going. Sometimes it really doesn't pay to be so lazy... I discovered I'd been using the wrong color for at least one of the symbols! That part there under her antennae is supposed to be 414. I'm not exactly sure what color it is, but certainly not the 414 which is quite a bit darker. Upon further inspection it seems that wasn't the only thread I had wrong. The top of that wing just doesn't look right. Normally, I might attribute that to the vagaries of HAED charts which often look off until all the surrounding stitches are filled in, when it suddenly all comes together. Fortunately in this case, Louann (Stitching Obsessions) is also working on this and her wing top is much better defined. Which leads me to believe I've messed up more than one of the symbols. Rather than try to figure out where the mistakes are and frogging, I've decided to scrap this one. Rather than move on to Angel of Frost, I think I'll replace Goblin Tree with Cirques des Cercles, which I'm dying to start anyway. Can you tell I really like Selena Fenech's artwork? This is the fourth of hers that I've worked on recently! I am stitching these ladies on 28 count Nebula Monaco dyed by Tirowen Fabrics. I had originally purchased Shadow Cashel opalescent dyed by Picture This Plus for this design (and had even started it). But the moment I saw this fabric I thought it would be the perfect background for this design. The link I have to Tirowen Fabrics no longer works, which is such a shame, I really liked her fabrics. When I ordered the Nebula, I also ordered a piece of Monaco in "Fuschia" which is the most gorgeous shades of pink and purple. 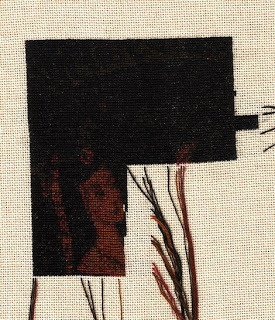 I still have no idea what I might stitch on it, but it was simply too lovely to resist -- a piece of art in and of itself! I also received a piece of Monaco dyed in the most lovely greens. I would have liked to use it for Cirques des Cercles, but the piece wasn't big enough. Speaking of Cirques des Cercles, I received the fabric I ordered and it is lovely. I changed my mind about the thread again, and started the design for the umpteenth time. And still wasn't happy, so I did a bit of test stitching and I think I have finally found something I can live with. Maybe. I also received the 40 count Lakeside Linen I ordered for the Days of Advant Sampler. I went with the Examplar, since I wanted something darker than what I'd seen other WIPs on. I just hope it's not too dark. I'm antsy to get started on these two projects, but for now have convinced myself to finish up with the current rotation iteration. Just Goblin Tree and Angel of Frost to go anyway. Eight days. Surely I can hold out for eight days? I've been itching to start this, and so I did! I got quite a bit done over the three day weekend - here is the first half of page one (4,000 stitches). A wonderful long weekend of stitching, movies, and sleeping! I'm stitching this on Silkweaver Skye Reflections Lugana 25 count so I don't have to stitch the sky you can see through the window. My sky won't have as many clouds, but no matter, the fabric is scrumptious! Thanks to everyone who leaves a comment! I enjoy reading them, but I'm a horrible correspondent, so please don't feel ignored if I don't respond. I'm so bad that when my mother calls me she usually starts with, "You didn't answer my e-mails, so I got worried...". I did want to answer a couple of questions, though. To Silver Thistle: Flower Power is a separate chart. It's by Crossed Wing Collection and you can pick one up at almost any ONS. The charts on the yahoo group are over one adaptions of the hummingbirds on the Flower Power chart. The pdf contains all of the xml files. To Cathy: Thread parking doesn't have to be confusing, once someone explains it! Becca has published a very detailed explanation (with pictures!) on the HAED board. Here's a link to her post. This is posted in the forum devoted specifically to parking, so you'll probably find tons of other valuable information there. My WIP looks messy because I start and end my threads by doing a waste knot to the right of my stitching -- only without the knot, I just leave a little tail. So those little tails are under my parked threads, which makes it appear that more threads are parked than actually are. This is how I do my parking: I work in 10 wide by 50 long columns. I usually start with the first symbol and work that thread until it runs out or I get to the bottom of the 50 rows. I'll then either park the thread in the first instance of the next 10 x 10 block below, or if there isn't one there I'll look to the right and park the thread in the next instance of the symbol in the next 10 x 50 column. I hope that makes sense, I'm not so good at explaining things if I can't use my hands to talk! I finally replaced the pile of junk I called a car. Actually, it wasn't really that bad. I've driven it for 9 years and put over 140,000 miles on it (in addition to the 60,000 that were on it when I got it). Of course, I don't know exactly how many miles since the odometer stopped working shortly after 200,000. It's been mostly reliable, except for the 4 or 5 times a year it just won't start. Which is what happened this morning. Turn the key and... nothing. This has happened twice before in the last 8 or so months and it was the starter both times. I've been planning on getting a new one, and so I decided to take the hint and once I did get it started I headed to the local car dealer. I am now the proud owner of a 2005 Ford Taurus. Big enough for me and the three kiddos to be comfortable, but still have reasonably good gas mileage. My dilemma with Cirques must have discombobulated me a bit since I put Beauty and the Beasts on the scrolls after I gave up on that. It wasn't until a couple of days later that I saw that Luna, Sol, and Stella was actually next in line! Oh, well. I will start on them tonight, which will put Goblin Tree in good position for a late start on the HAED BB Easter Creature SAL. Although I may go off on a tangent and work on Love and Magic for the SAL. Lovely creatures in that one. 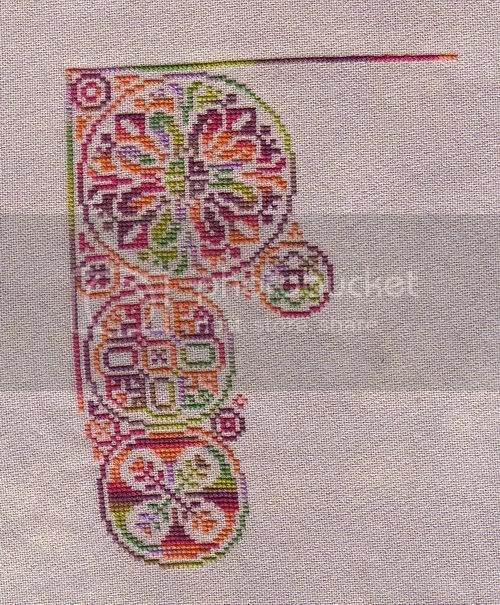 And here's a new scan of Flower Power, which was shunted aside when the disappointing Cirque fabric arrived. I didn't get very much done, only 7 more of the foxglove blooms, but I very much enjoyed working on it, so perhaps we'll be seeing it a bit more often. I also wanted to answer Gaby's question. The over one hummer charts are available from the Flower Power 2 Yahoo group. You don't have to wait for approval to join and a pdf of the charts is available along with the original Excel files. Much easier for most of us!